Everyday Tells A New Story at Keota Health Care Center. Check out STORIES on our website to learn more about what’s happening at Keota Health Care Center. Whether it’s information about activities and events, or tales of employees who went the extra mile, we want to share our news with you. Join us for stories of the past, such as events that brought joy or inspiration to our Residents, New Chapters and stories about present-day acts of kindness and people who pay it forward. If it’s happening at Keota, you will read about it here, because we put our Residents First! Kat Willison​ is Keota Health Care Center’s August 2018 Customer Service Superstar! 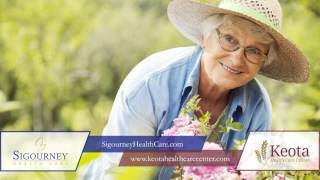 Here's our latest TV commercial featuring Keota Health Care and Sigourney Health Care Center.